This is the reason people dont play VU. hey skinny why you preping a friend. I have lost all respect for you and youll be slated on the Forum. Unfortunately you applied too late and not until one of my members started attacking you, however if you feel like restarting on Mantrax after he is done with you I will accept your app. I know, it's not ideal but its the best I can offer. I wouldnt apply to a kingdom that Farms New members just OOP Infact the only reason I sent an app was to get your responce to prove my point kingdoms like yours stop New people from Playing So I thank you for your offer but Ill gladly decline. This is the reason people dont join the game because bullies such as yourself pick on them. Is it not obvious I dont know him I was hoping he was a decent gameplayer. Not once did I mention I was a New player so whats your Point? Visual Utopia - A massively multi player strategy war game! So this game is all about strategy and war. You get attacked and you complain? There are two types of players, farmers and attackers. Farmers will build up their income and in the long run come up with huge armies if they dont get killed while farming. 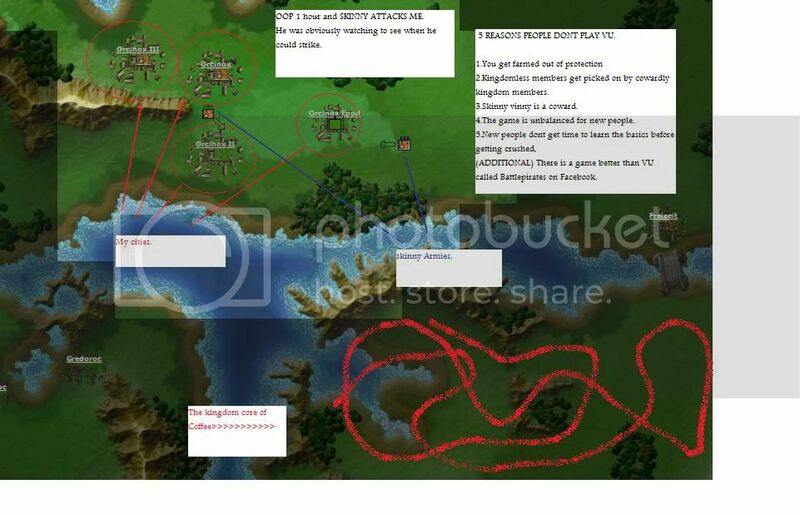 Attackers rather take cities then build their own, getting income to get stronger armies but if they dont find targets they fall behind too much. You do not have a Kingdom, and you didnt make any diplomatic relations, so bad strategy, you could expect problems cause afterall its a war game like I said. Multiple characters option in this game made it possible to be friends with people on one map and fight them on another map, I had that happen many times. Its all a part of the game, and even if you fight some guys they are still your friends. Nobody likes crybabies, so rather fight your way to survive and be honorable, dont go insulting cause someone is attacking you. @Endless: why must you pick on him, ive warned you about this stuff! @Orcinox: if you want a teacher, i can teach you to not be bashed on. There is a simple point in the Thread Yous are all missing. It doesnt matter what World you are on Kingdoms pick on New/Kingdomless Players. offcourse all those who posted the negitivity above are obviously the ones who Normally bash New/kingdomless Players. 1. Kingdomless Guy lets recruit? 2.Kingdomless Guy lets gain Income? 3.Kingdomless Guy lets pick on him so he doesnt play again? Zond Thanks It seem you might be the only one to see my point although I have a high amount of experience and wooped skinnys arse many times along with Endless and Stormcrow Its just Obvious that they would post above when there all guilty of Sitting on New people OOP. You're missing the point (or just trolling). Its a war game, you attack or get attacked. I lost to Coffee, AOA did not have my back, so even if you're not kingdomless you can get your arse kicked. I restarted, if you can't beat them then you can join them or join the kingdoms they are warring or choose not to play. Get over it man (nobody cares who you are or whose arse you kicked in the past - you win some you lose some). It would normally comment similarly to how Stormy did, because if you were real it would be so full of fail. What am i up Too? The above players gave up and are traitors. Genocide: AOA did not have my back, so even if you're not kingdomless you can get your arse kicked. Really? Like the whole KD is going to stop what its doing to ignore the core and come help your 3 cities. Its called a team and you should learn to do whats best for it. Thats why we have blockers and a core. Even with all four of you turning on us, you leaving us was the best thing to happen to us. Sigh.. this is the nature of this game.. When your kdless.. find a corner, and FARM! I have city with 101 buildings and already being camped by Lightshield's dwarf corps. Enough said. Hey! I just realized you're a Bear , we cleaned you guys up already :D Your new start should be interesting. Yea, this is the third time literally the same exact thing has happened. A week into first starting and this? Orcrinox is right. Yeah start late and suffer . the people that play it are on the internet. Should have been obvious. But you're right, should have been obvious. Not even close to as how much it applies in this game. Perhaps make a suggestion thread on what you think might work (more worlds or whatever), ZeTa probably will read it before he reads this one. so i take it that you can no longer troll people anymore? cuz i see alot of people that could use some good old fashioned trolling but no one is even being mean... kinda makes a guy sad.. you know?